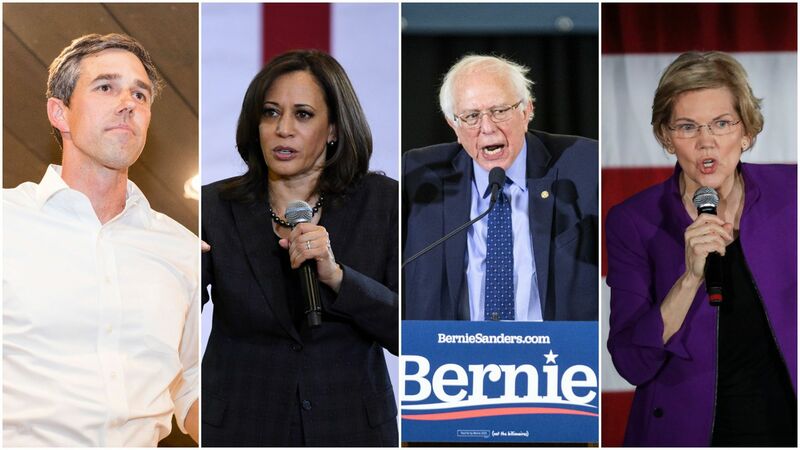 Democratic presidential candidates are laying out plans for universal health-care coverage, with Medicare for All overpowering the conversation. The big picture: All 2020 Democrats said they believe in the concept of universal health care, except they vary on how to get there — and on which plan can be more appealing to achieve nationwide support. The Medicare for All bill from Sen. Bernie Sanders has 16 co-sponsors including several 2020 Democrats. Both Sanders' bill and a bill from Rep. Pramila Jayapal (D-Wash.) lay out paths for eliminating private health insurance. Sen. Brian Schatz (D-Hawaii) reintroduced a bill in February that offers a buy-in option. Sen. Bernie Sanders (I-Vt.): Wants to eliminate private insurance and establish a single source of health-care coverage for prescriptions, medical, vision, dental and mental health care. Sen. Kamala Harris (D-Calif.) has stuck by Sanders' bill, telling CNN's Jake Tapper that the U.S. needs to eliminate going through an insurance company and "move on." She also co-sponsored the Medicare at 50 Act and Schatz's State Public Option Act. Former HUD Secretary Julián Castro: Supports it, saying at an event with Iowa Democrats that the U.S. should "be the healthiest nation," per the Hill. Rep. Tulsi Gabbard (D-Hawaii): Supports Medicare for All, but doesn't want to eliminate private insurance. Former Colorado Gov. John Hickenlooper: Supports single-payer health care, advocating for the general idea rather than a specific policy. New Age spiritual guru Marianne Williamson: Supports a "Medicare for All model," according to her campaign website. Former tech executive Andrew Yang: Advocates for a single-payer health-care system. Sen. Cory Booker (D-N.J.) is a co-sponsor of Sen. Debbie Stabenow's Medicare at 50 Act, which allows ages 50 to 64 to buy into Medicare. Booker is a co-sponsor on Sanders' bill. Sen. Amy Klobuchar (D-Minn.): Told CNN she wants to expand Medicaid and Medicare and doesn't want to get rid of private health care right away. Supports Medicare at 50 Act. Former Texas representative Beto O’Rourke: Supports universal health care but is not including Medicare for All in his presidential campaign. He is backing a House Democratic proposal called Medicare for America, which calls for expanding government-run health coverage while keeping employer-sponsored insurance plans, CNN reports. Sen. Kirsten Gillibrand (D-N.Y.) is a co-sponsor on Sanders' bill and supports Medicare at 50 Act. Sen. Elizabeth Warren (D-Mass.) supports Medicare for all, but has been vague about how to achieve it. Her campaign website calls for a "down payment." And at a CNN town hall in March, she said she would "get everybody at the table" to "figure out how to do Medicare for all," which could include a "temporary role" for private insurance companies. Former representative John Delaney: In an interview with CNBC, Delaney said he supports creating a universal health care system, but not Medicare for All. The bottom line: Medicare for All has been a more divided idea among Americans compared to a buy-in, per Kaiser polling from January. Presidential candidates have been slow to endorse Medicare for All in its entirety as Republicans criticize the party for embracing more socialist ideals.